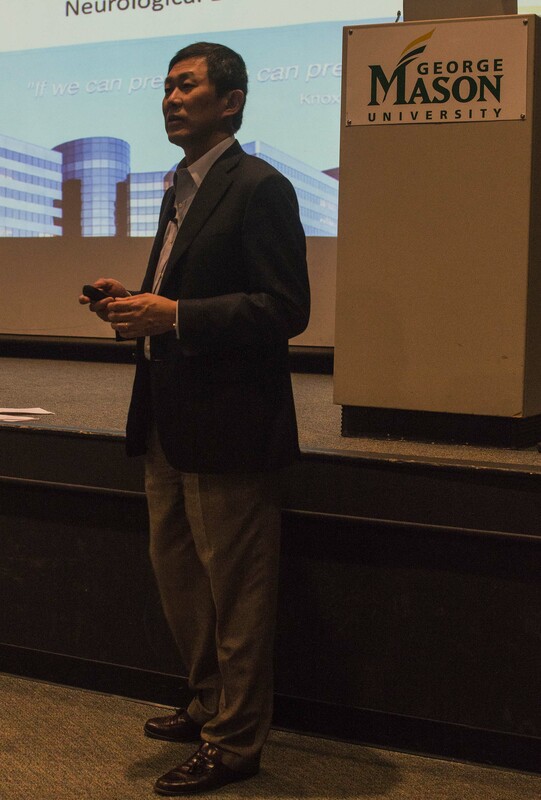 On Tuesday, Provost David Wu and Senior Vice President of Administration and Finance J.J. Davis hosted a town hall to discuss how Governor Terry McAuliffe’s proposed budget for higher education would affect Mason. Although student attendance was low, the Johnson Center Cinema was nearly overflowing with faculty and staff members. Wu and Davis’s presentation included a simplified comparison of the contents of the budget proposal created by McAuliffe, the revisions conducted by the House of Delegates and the separate revisions proposed by the Senate. The town hall also included a segment called the “state of the university,” which highlighted various programs in development at Mason. According to Wu and Davis, Mason receives 23 percent of its financial support from the state. Therefore, the Virginia budget for higher education influences Mason expansion projects and its means of operations. Mason’s first priorities in reference to the budget are increased student financial aid, the attraction and retention of top talent, advances in multidisciplinary research and dedicating resources to support career-ready graduates. did not prescribe additional funds for graduate students, nor did it fully satisfy Mason’s planned expansion of multidisciplinary research at the Institute of Biomedical Innovation or provide the university the amount of money it hoped to raise through private donors. Perhaps most notably, the governor’s proposal includes a two percent compensation for faculty, but only beginning in fiscal year 2018. The House-proposed budget includes a three percent compensation for both fiscal years 2017 and 2018, provides additional research funding and shows a substantial increase in the funds dedicated to career-readiness programs. The Senate-proposed budget includes additional funding for financial aid reserved for graduate students, a two percent salary increase beginning in 2017 and maintained through 2018, and also offers similar research funding and resources geared toward producing career-ready students. Both Wu and Davis spoke positively about Mason’s recent financial and structural achievements. Mason has drafted comprehensive financial metrics; retained stable bond ratings; elevated to a Research 1 University, according to the Carnegie Classification of Institutions of Higher Education; and established a Diversity and Leadership Inclusion Council. Both Wu and Davis expressed their excitement in regards to upcoming Mason projects. Mason is moving forward with the renovation of Robinson Hall to upgrade its facilities and modernize its interior. Mason is also working to develop its utility infrastructure including sewer, water and electric systems on campus. The university is facing a “larger need to upgrade telecommunication infrastructure,” Davis said. This $47 million project will seek to increase fast, accessible internet access and meet the needs of students and faculty who often have multiple technological devices on campus every day. Davis also spoke of the beginnings of Mason’s new student housing proposal. “As you may know, we are out of beds,” she said. The University Life Working Committee is currently working on a proposal to expand student housing opportunities on and off campus to approximately 1,000 beds. In early spring of 2016, Mason will also focus on “forming [a] more comprehensive strategy online,” according to Wu. Mason is currently exploring outside companies to help enhance existing online education through the Virginia Degree Completion Network. Wu emphasized the need to increase the availability of online courses to meet student demand. Eve Dauer, the current university registrar, said this budget meeting was “the best town hall so far.” Dauer said Wu and Davis have made adjustments to present more relevant information to the attending faculty, staff and students. This was confirmed by Wu and Davis, who have been asking Student Government and other student organizations for their input on how to improve town hall meetings. They said they are improving these regular town halls by working to present information in a way that Mason faculty and students can more easily understand. Click here to view the budget town hall presentation.